Product Geek. Rapid Prototyping Evangelist. Traveller & Minimalist. Currently interested in AI & conversational computing. It is now quite easy to build a simple chatbot which responds to a few keywords or buttons, and they can be fun, however they do not give the user a magical experience. One of the coolest things about innovative new technologies is that they seem like magic when they are first introduced. The first car magically moved without horses. The first telephone magically threw a voice into someone’s far away ear. The first video was a magical moving picture, like Harry Potter! Today, people are craving a similar magic. Where is the future we were promised, where Hal 9000 manages our interplanetary spaceships? What CAN you do today, Hal? To give the public the magic they are craving, we as Botmakers need to do a lot better. We need to build bots that actually solve our users’ problems. Bots that work quickly, effectively, and don’t force our users to learn complex commands or memorize phrases. We need bots that seem like magic. Make chatbots that perform just as well as humans. Humans default to conversation because it is the primary way we have learned operate in the world. However, we only use conversation with other entities (humans mostly) of similar capabilities, who can understand what we are communicating quickly and without explicitly stating context. When the entity you are conversing with does not understand you as well as most of the other entities you converse with, you get frustrated or even angry. Right now, humans turn to a conversational channel because dealing with machines is confusing, complex or broken. When the machine does not understand them, or does not provide what they are looking for, they just want to ask a human for help. If you send users from a GUI based machine that confuses them to a conversational machine that barely understands them, you just frustrate your users even more. But when your chatbot can match or even outperform humans, it will be magical to the user. This does not necessarily mean that a bot needs to pass the Turing Test; the bot only needs to perform well in the bot’s area of expertise. If a human can answer a user query with no follow up question, so should your bot. If a human needs further information, then your bot is allowed to request more. It is a simple concept, but hard to implement. So I’ve created a practical set of guidelines to help you build chatbots that perform less like machines, and more like humans. These laws, named after the first chatbot, are designed to help your chatbot perform just as well as humans. When building your chatbot, these laws will help guide you through every interaction to ensure the experience is magical. Don’t Be A Command Line. Chatbot value decreases with number of parameters requested by the bot. Infer context when possible. Humans can usually infer a lot of implicit information from the way someone asks a question. Humans also do not need your name, address, phone number, email, date of birth, etc in order to participate in a conversation with you. When a chatbot needs to ask for more information, put yourself in the conversation. Would you be asking for that information yourself? If not, why? How can it be inferred? Remember conversation history. Keep track of where the conversation is. Pull any source of information on the user at your disposal. Most humans do not suddenly forget everything you mentioned 3 sentences ago. Conversation with humans often builds on facts established earlier in the conversation. Bots should take advantage of the fact that they have perfect recall and keep past contexts in mind during the current conversation. Look at user history to predict future behaviour. Listen for actions they are planning, and follow up. Humans will adjust their conversation based on what they know about a person and their previous behavior. If you know your co-worker likes tacos, you will invite them when you get tacos for lunch. At the same time you wouldn’t continue to pester a co-worker who has indicated they dislike tacos. Bots have an advantage here with a bit of intelligent planning. Humans turn to chat for the best information, not all the information. Be much better than Google. How many times have you Googled something, only to discover non-useful results, and then asked friends for advice? As the signal to noise ratio on the internet continues to worsen, and the noisy are getting better at looking like signal, algorithm based searching is getting less effective. A human will ask another human they consider to be an authority for the best answer to their question. They do not expect other humans to return a list of possible answers. Bots should also provide the best answer, not a lot of answers. If you can’t do it algorithmically you need to curate manually. 4 minutes is far too long for a quick acknowledgement! Immediate response time is necessary. If users have to wait they can do it elsewhere. Be more convenient than other options. When you ask a human a question, you expect that they will immediately understand what you are asking no matter how you ask. Humans often turn to conversation because they think it might be quicker than other more complicated options, like sifting through search results. But if conversation is not quick, they will move on. Since bots are always on, they have an advantage with initial response time, but bots also need to understand what the user is asking nearly immediately. The bar is about as long as it would take a human would take to type out the response. Do not require commands and precise syntax like a command line. Understand regular conversational english. The whole point of using natural language is to communicate the way you prefer to communicate. Humans understand perceive things differently and ask questions in different ways. Chatbots need to understand humans just as well as most other humans could. This does not rule out commands and keywords, as humans often communicate with linguistic shortcuts once a common subset has been established. However chatbots should not require precise syntax. Humans and bots make mistakes. Users should always be able to start over, make changes, or completely escape. Sometimes humans get into conversations without correctly establishing the base facts. It is perfectly natural to start over, erase mistakes, and re-establish the premise of the conversation. Humans do not continue to drive forward a conversation when it becomes clear that the other party is lost, so chatbots should not either. Provide documentation and guidance when users ask for. Fall back to humans if needed. Humans let people know what their expertise is and how they can help. Bots should do the same. Humans also defer to other humans when a request is beyond their abilities. Bots are restricted to the narrower abilities than most humans, but they can still defer to humans when the user needs to go beyond what a bot has available. In part 2, we will introduce the “Magical Chatbot Experience Design Framework” framework, which will help you put ELIZA’s 8 Laws into action. Don’t miss out on part 2! Sign up to get notified the moment it is published. Originally published on DigitalEngine.io, where we are using AI to automate customer service conversations. At Digital Engine, we see a future where every business will be required to use AI technologies to stay competitive. For now, AI and chatbots are a strategic advantage for both consumer facing and B2B companies. Talk to our chatbot to schedule a free brainstorming session on applications in your business. A rant about chatbots from annoyed millennials. Will Robots Turn Us All Into Paperclips? This is a post from Michael Simmons, co-founder of Empact. At the age of 10, Benjamin Franklin left formal schooling to become an apprentice to his father. As a teenager, he showed no particular talent or aptitude aside from his love of books. 1. Plan out the learning. This allows us to think carefully about what we want to learn. We shouldn’t just have goals for what we want to accomplish. We should also have goals for what we want to learn. 2. Deliberately practice. Rather than doing things automatically and not improving, we can apply the proven principles of deliberate practice so we keep improving. This means doing things like taking time to get honest feedback on our work and practicing specific skills we want to improve. 3. Ruminate. This helps us get more perspective on our lessons learned and assimilate new ideas. It can also help us develop slow hunches in order to have creative breakthroughs. Walking is a great way to process these insights, as shown by many greats who were or are walking fanatics, from Beethoven and Charles Darwin to Steve Jobs and Jack Dorsey. Another powerful way is through conversation partners. 4. Set aside time just for learning. This includes activities like reading, having conversations, participating in a mastermind, taking classes, observing others, etc. 5. Solve problems as they arise. When most people experience problems during the day, they sweep them under the rug so that they can continue their to-do list. Having slack creates the space to address small problems before they turn into big problems. 6. Do small experiments with big potential payoffs. Whether or not an experiment works, it’s an opportunity to learn and test your ideas. The five-hour rule flips the equation by focusing on learning first. To see the implication of this, let’s look at a sales call (note: replace “sales call” with any activity you do repeatedly). Most professionals do a little research before the call, have the call, and then save their notes and move on. Somebody with a learning focus would think through which skill to practice on the call, practice it on the call, and then reflect on the lessons learned. If that person really wanted an extra level of learning, he or she would invite a colleague on the call and have the colleague provide honest feedback afterward. Embracing a learning lifestyle means that every time we make a sales call, we get better at doing sales calls. Focusing on learning un-automates our behaviors so we can keep improving them rather than plateauing. Every event is an opportunity to improve. By focusing on learning as a lifestyle, we get so much more done over the long term. So, are you ready to embrace the five-hour rule? Want to read the most-recommended books by top leaders like Bill Gates, Mark Zuckerberg, Sheryl Sandberg, and Elon Musk? Here’s our report on the six highly recommended books you should read, along with 460-plus of their other book recommendations. Uber drivers are not self-employed and should be paid the “national living wage”, a UK employment court has ruled in a landmark case which could affect tens of thousands of workers in the gig economy. The ride-hailing app could now be open to claims from all of its 40,000 drivers in the UK, who are currently not entitled to holiday pay, pensions or other workers’ rights. Uber immediately said it would appeal against the ruling. Employment experts said other firms with large self-employed workforces could now face scrutiny of their working practices and the UK’s biggest union, Unite, announced it was setting up a new unit to pursue cases of bogus self-employment. Research by Citizens Advice has suggested that as many as 460,000 people could be falsely classified as self-employed, costing up to £314m a year in lost tax and employer national insurance contributions. Four courier firms are already facing legal action from cyclists who want similar recognition as staff employees and the rights that go with that status, while delivery firm Hermes is under investigation by HM Revenue & Customs. The Uber ruling could force a rethink of the gig economy business model, where companies use apps and the internet to match customers with workers. The firms do not employ the workers, but take commission from their earnings, and many have become huge global enterprises. Uber now operates around the world, with the company valued at more than £50bn. The decision of the employment tribunal comes amid mounting concern within government about the growing trend towards self-employed workforces. The government has recently announced a six-month review of modern working practices and HMRC is setting up a new unit, the employment status and intermediaries team, to investigate firms. MPs launched an inquiry last week into pay and working conditions in the UK which will look at the status and rights of agency and casual workers and the self-employed for the purposes of tax, benefits and employment law, and how to protect them. Read the latest news from across the world and save articles to read across your devices and desktop. Friday’s ruling by a London employment tribunal involves a case taken by two drivers, James Farrar and Yaseen Aslam, on behalf of a group 19 Uber workers who argued that they were employed by the San Francisco-based firm, rather than working for themselves. At a hearing in July, Farrar told how he was put under “tremendous pressure” to work long hours and accept jobs and said that there were “repercussions” from the company if he cancelled a pickup. He said some months he earned as little as £5 an hour – far below the £7.20 that employers are obliged to pay workers aged over 25. Uber argued that it was a technology firm not a transport business and that its drivers were independent self-employed contractors who could choose where and when they worked. The judges were scathing about Uber’s arguments, however, accusing the firm of “resorting in its documentation to fictions, twisted language and even brand new terminology” and even quoting Hamlet to suggest that the group’s UK boss was protesting too much about its position. Nigel Mackay from the employment team at law firm Leigh Day, which represented the drivers, said: “We are pleased that the employment tribunal has agreed with our arguments that drivers are entitled to the most basic workers’ rights, including to be paid the [national living wage] and to receive paid holiday, which were previously denied to them. The GMB union, which took up the case for the drivers, said that it was a “monumental victory” which would have an impact on thousands of workers in other industries “where bogus self-employment is rife”. Farrar said he was thrilled with the “emphatic” ruling. He said his industry had seen the deterioration in workers’ rights since Uber entered the market. “We’ve brought that to a halt,” he said. The ruling should be regarded as “ a salutary lesson by businesses who try to arbitrarily ‘classify’ workers as contractors to avoid affording them their full rights as workers,” Goodwin said. The GMB’s Ludkin said employers should be “on notice” that it was reviewing similar contracts. “This is old-fashioned exploitation under new-fangled jargon, but the law will force you to pay GMB members what they are rightfully due,” she said. There were calls for more clarity over employment status, with Citizens Advice pointing out that many people were locked out of employment tribunals by fees of up to £1,200. The ruling is not the end of the process for Uber. The firm will take the case to the employment appeal tribunal, and following its decision there could be further hearings in the court of appeal and then the supreme court. Any payments due to drivers will not be calculated until that process is over. Other drivers with the firm will not automatically receive payouts but, if the firm accepts the ruling, it will have to change its contracts to avoid more cases being taken by drivers. Lawyers say that its terms and conditions are similar for all of its UK employees. Jo Bertram, the regional general manager of Uber in the UK, said many of the firm’s drivers did not want to be classified as workers: “Tens of thousands of people in London drive with Uber precisely because they want to be self-employed and their own boss. £5 The hourly wage received in some months by one of the drivers who took the case. $62.5bn Uber’s valuation based on its last round of funding. Seven The years that Uber has been in operation. Due to the large number of comments, they are being shown 100 per page. Well that’s put a cat amongst the pigeons. Bye bye Uber. No more cheap car trips. Knowing that employees will not be exploited may at least sway me to using Uber occasionally…. that’s if Uber survives the change in business model. I’ll be asking my employer if I can have the right to rock up to work whenever I feel as an uber driver does. exactly. they signed up to this model of working freedom and now want to milk it as a job it was never designed to be. shame. Which version of xposed do I install ? If drivers indeed make minimum wage, as they claim, why would a Uber be fighting this do hard? Truth is, Uber Drivers are treated terribly, and few can eek out minimum wage , despite working hard. Uber Treats it’s drivers like commodities. Often does not pay us what we are owed (according to Their own rules), and even when they do, it falls Far Below minimum wage for Must drivers. Example: in California, I drove 9 hrs straight, nearly 250 miles, for $48 _Before_ Expenses !! It’s almost like I’m paying Uber for the “privilege” of driving for them, and receiving de-motivating negative feedback from them, whilst going out of my way to provide Top Notch Customer Service. They treat us like commodities, telling us to do more, meanwhile, their own customer service is non-existent. They don’t addresses issues us drivers experience. They own driver app is full of bugs, and They Punish US for their mistakes. In fact if or rating falls below 4.61, they deviate us. Lay I looked their apps don’t even hold 4.6 Rating in the spp site. By their own definition, They should be Deactivated ! Keep in mind, a rider can either rate a driver “5*: Perfect – never had such an amazing ride”, or “4*: You’re fired”, or “1*-3*: You’re sooi fired, I hope to never see you behind a wheel again”. People are conditioned to actually mean “3*: everything fine. As expected. I’ll use again”, “2*: some issues”, “1*: Terrible!, may not use again, may complain about this driver, or your app is awful”, and “4*: excellent, above the average Uber driver (which are already great)”, and “5*: Best Ever”. Fact is, most riders think they are providing Positive Feedback when they taste a driver 3* or 4*. They are shocked to find out they are adding additional stress to their driver’s life, and are inching him/her closer to deactivation. Additionally, riders often give a lower start rating because of an issue with the App or the Uber platform itself, and Uber’s Own shortcomings get tagged onto the driver’s own demise in Uber’s eyes. Uber doesn’t look to themselves. Instead they keep telling the driver’s to reach to higher perfection. So, Uber Drivers now also have to become sales people, encouraging All riders to rate them (none are required to do so. Once at their destination, their mind is on other things, and They often will only bother to rate if was less than perfection.) Not only that, but Uber Drivers need to gently encourage a 5* Rating, because a 4* could be damaging. So in addition to perfection, unheard of customer service, and perfect driving, you gotta be a sales person just to get by on this platform. And That doesn’t guarantee a livable wage, or reasonable work conditions. I love the idea of ride-sharing, and having a “flexible”schedule (though Uber Definitively has their own ways of practically forcing drivers to work when, and as much as Uber wants them to work). They keep drivers in debt, and fearful that they’ll turn driving access at any time. Ooh, I’ve got stories. They’ve cheated me out of nearly $2000. And that’s including what we REALLY Ought to be paid to keep up with a living wage. That’s what they have cheated me out of the pay I was supposed to have earned. They Low Ball us to begin with, then rip us off on what’s left. Meanwhile they are bullies in their owncommunications, and terrible at their own jobs. Actually, they are GREAT at Marketing. And hiring Lawyers. And obtaining Funding. Sure they are Great at siphoning money for themselves. But terrible at providing the services and payment we depend on to do their bidding for them. And that does not even count the bullying they do to force other ride share companies out of business, creating a monopoly for themselves. Which only furthers their position to treat drivers terrible, And underpay them. Uber NEEDS to be STOPPED ! Not ride sharing in general. That’s a wonderful concept. For most people, I don’t recommend becoming an Uber driver. Unless you’re a great sales person. Then your business will be to sign up other drivers to collect that commission. You won’t likely make money from driving itself. There are a few locations where money can be made just by driving, and even then your chances are best if you drive for their limo-like black car device, rather than Uber X and Uber Pool, which is what services the majority of the public. Oh and if you are a great salesman, you probably will only make money if you lie about how great it is to work as a driver. The ONLY way to be truley honest is to tell everyone, as I did above, that the money is made in getting suckers to sign up, and become sales people, or if you have a black car with leather seats – IF Uber for your city is still accepting Uber Black sign ups. If you just want a bit of fast cash spending money on occasion, and it’s not like a real job for you, then Uber driving can also work out. More than a hundred Uber drivers have mounted a go-slow protest through central London to put pressure on the city’s mayor, Sadiq Khan, to insist the US company guarantee the minimum wage. At least 100 Uber minicabs drove at walking pace down Edgware Road and Park Lane towards Westminster on Tuesday, honking their horns and blocking traffic as drivers angry at low pay for long hours stepped up direct action against the San Fransisco-based firm. Protest by Uber taxi drivers in London. The protest infuriated some drivers who found themselves blocked behind a line of slow-moving Toyota Prius cars. One angry black-cab driver shouted: “Do the knowledge!” a reference to the way cabbies have to memorise streets before getting their license rather than rely on GPS maps as Uber drivers do. The action was organised by James Farrar and Yaseen Aslam, who three weeks ago won a crucial employment tribunal verdict that Uber should treat its drivers as workers rather then self-employed. The ruling means drivers should be paid the national minimum wage, receive sick pay and holidays. Uber said it would appeal the judgment. Farrar and Aslam have established a representative group for minicab drivers, mostly working for Uber, called United Private Hire Drivers (UPHD). UPHD also sent a letter to Khan apologising for the disruption of its protest, but suggested Uber’s business model resulted in “abuses that would be more fitting of Victorian era London than a 21st-century global mega city”. Uber insists that its drivers earn more and said that the only case of a driver earning £5 per hour over 90 hours was because they were declining fares. But several drivers who took time off work to join the protest said their earnings were below the legal minimum. An Uber driver takes part in the protest. “I am working 70 to 80 hours a week, which comes out at £4 an hour which is below the minimum wage,” said Ibrahim, 30, an Uber driver for 18 months. It claimed its own polling showed 90% of drivers were “satisfied with driving with Uber, and a majority say the amount of money they make, as well their ability to balance work and family life, has increased since they started driving with us. With the “sharing economy” growing in popularity, the startup Turo is trying to introduce a new ownership model to the car industry that could lower the cost of ownership and get more out of your car. In a new post, the company’s CEO, Andre Haddad, released some statistics about Tesla Model S owners using Turo. Haddad argues that Tesla owners using Turo can pay their monthly car payments entirely by renting out their vehicle roughly 7 days out of the month. I would also note that Turo is putting the average of all Tesla Model S cars against the monthly payments of the cheapest version possible, a Tesla Model S 60. Other versions of the Model S are listed for rent on the site (here are the LA listings) and are likely being accounted in the average here. So I would take this data with a grain of salt. Nonetheless, the idea to lower the cost of ownership for a Tesla is an interesting one, especially now that all new cars are equipped with self-driving capable hardware. I can see people buying a Tesla without the pricey option which isn’t even available yet, and renting it out until it becomes available. At which point, you can put the car on the upcoming ‘Tesla Network’ and more conveniently use your own car since you can just automatically send it out to give ride when you are not using it. What do you think? Would ever let someone else drive your $60,000+ Tesla? Let us know in the comment section below. If you want to install a solar array at your home or business, you can see if it makes sense for your property and if you can be saving money on your energy bill with a free solar quote here. Tesla is a transportation and energy company. It sells vehicles under its ‘Tesla Motors’ division and stationary battery pack for home, commercial and utility-scale projects under its ‘Tesla Energy’ division. Few firms are the subject of so much fascination, rumor, or speculation. Everyone has heard of Renaissance; almost no one knows what goes on inside. (The company also operates three hedge funds, open to outside investors, that together oversee about $26 billion, although their performance is less spectacular than Medallion’s.) Apart from Simons, who retired in 2009 to focus on philanthropic causes, relatively little has been known about this small group of scientists—whose vast wealth is greater than the gross domestic product of many countries and increasingly influences U.S. politics 1 —until now. Renaissance’s owners and executives declined to comment for this story through the company’s spokesman, Jonathan Gasthalter. What follows is the product of extensive research and more than two dozen interviews with people who know them, have worked with them, or have competed against them. Renaissance is unique, even among hedge funds, for the genius—and eccentricities—of its people. Peter Brown, who co-heads the firm, usually sleeps on a Murphy bed in his office. His counterpart, Robert Mercer, rarely speaks; you’re more likely to catch him whistling Yankee Doodle Dandy in meetings than to hear his voice. 2 Screaming battles seem to help a pair of identical twins, both of them Ph.D. string theorists, produce some of their best work. Employees aren’t above turf wars, either: A power grab may have once lifted a Russian scientist into a larger role within the highly profitable equity business in a new guard vs. old guard struggle. For outsiders, the mystery of mysteries is how Medallion has managed to pump out annualized returns of almost 80 percent a year, before fees. “Even after all these years they’ve managed to fend off copycats,” says Philippe Bonnefoy, a former Medallion investor who later co-founded Eleuthera Capital, a Switzerland-based quantitative macro firm. Competitors have identified some likely reasons for the fund’s success, though. Renaissance’s computers are some of the world’s most powerful, for one. Its employees have more—and better—data. They’ve found more signals on which to base their predictions and have better models for allocating capital. They also pay close attention to the cost of trades and to how their own trading moves the markets. But as computing power becomes ever cheaper and competitors sharpen their skills, will Medallion continue to mint money? 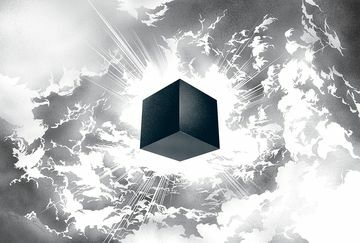 Quants seem like saviors to investors disappointed with how mere mortals have managed their money of late. In 2016 clients plugged $21 billion into quant hedge funds, while pulling $60 billion from those that do everything else. 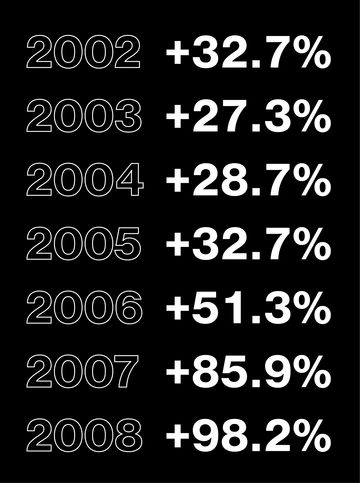 One noteworthy quant shop, Two Sigma, managed just $5 billion during the financial crisis and has seen assets jump to $37 billion. 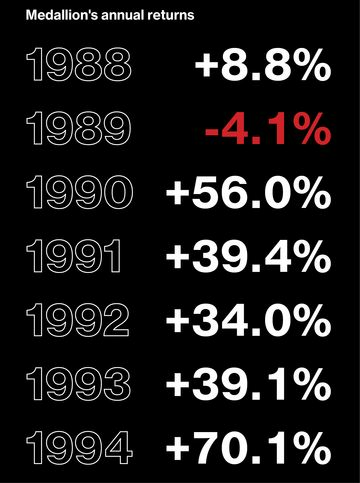 Even old-fashioned traders such as Paul Tudor Jones and Steve Cohen are adding to their computer scientist ranks in hopes of boosting returns. Renaissance’s success, of course, ultimately lies with the people who built, improved upon, and maintain Medallion’s models, many of whom met at IBM in the 1980s, where they used statistical analysis to tackle daunting linguistic challenges. This is their story. Simons is already well-known: math genius, professor at MIT and Harvard, recipient of the Oswald Veblen Prize in Geometry, and co-creator of the Chern-Simons theory. He was also a code breaker for the Institute for Defense Analyses, where he worked finding messages amid the noise. The goal of quant trading is similar: to build models that find signals hidden in the noise of the markets. Often they’re just whispers, yet they’ll help predict how the price of a stock or a bond or a barrel of oil might move. The problem is complex. Price movements depend on fundamentals and flows and the sometimes irrational behavior of people who are doing the buying and selling. Eventually the scientists went so far as to develop an in-house programming language for their models rather than settle for a numbercentric option such as ASCII, which was popular at the time. Today, Medallion uses dozens of “strategies” that run together as one system. The code powering the fund includes several million lines, according to people familiar with the company. Various teams are responsible for specific areas of research, but in practice everybody can work on everything. There’s a meeting every Tuesday to hash out ideas. 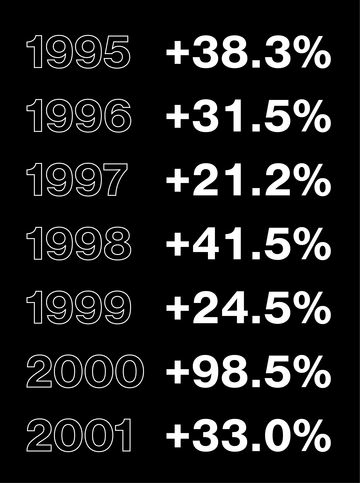 In the early 1990s, big annual returns became the norm at Renaissance: 39.4 percent, 34 percent, 39.1 percent. Prospective investors clamored to get into Medallion, but the company didn’t pay them much heed—or coddle clients for that matter. Bonnefoy recalls dialing a Manhattan phone number to hear a recording of the monthly returns; Renaissance’s legal department doubled as unhelpful customer service representatives. (To this day the company’s website, rentec.com, looks like it dates from the Netscape era.) In 1993, Renaissance stopped accepting new money from outsiders. Fees were also ratcheted up—from 5 percent of assets and 20 percent of profits, to 5 percent and 44 percent. “They raised their fees to exorbitant levels and were still head and shoulders above everyone else,” says Bonnefoy, who, along with every other outsider, was finally booted from Medallion in 2005. Encouraged by Medallion’s success, Simons by the mid-’90s was looking for more researchers. A résumé with Wall Street experience or even a finance background was a firm pass. “We hire people who have done good science,” Simons once said. The next surge of talent—much of which remains the core of the company today—came from a team of mathematicians at the IBM Thomas J. Watson Research Center in Yorktown Heights, N.Y., who were wrestling with speech recognition and machine translation. In the early days of tackling these problems, computer scientists teamed with linguists and tried to code grammar. At IBM, a group including Mercer and Brown reasoned that the problems would be better solved using statistics and probabilities. (Their boss, Frederick Jelinek, liked to say, “Whenever I fire a linguist, the system gets better.”) According to scientists who worked at the research center then, the team fed reams of data into its computers. Documents from the Canadian Parliament, for instance, were available in both English and French, which none of the scientists spoke. (Mercer once disappeared for several months to type French verb conjugations into a computer, according to a source.) The data allowed them to write an algorithm that found the most likely match for the phrase Le chien est battu par Jeanwas “John does beat the dog.” A similar approach applied to speech recognition: Given auditory signal x, the speaker probably said the word y. “Speech recognition and translation are the intersection of math and computer science,” says Ernie Chan, who worked at the research center in the mid-1990s and now runs quant firm QTS Capital Management. The scientists weren’t just working on academic problems; they were also developing theories and writing software to implement the solutions, he says. The group’s work eventually paved the way for Google Translate and Apple’s Siri. Mercer and Brown went to IBM’s management in 1993 with a bold proposition, says a person who knows the two: Let them build models to manage a portion of the colossal company’s then-$28 billion pension fund. IBM balked, questioning what computational linguists would know about overseeing investments. But the duo’s fascination with financial markets was just beginning. That same year, Nick Patterson, a former code breaker for British and U.S. intelligence agencies, joined Renaissance and approached acquaintances Brown and Mercer. “IBM was in serious trouble, and morale was poor, so it was something of a recruiting opportunity,” says Patterson, who worked at Renaissance until 2001 and is now a senior computational biologist researching genetics at the Broad Institute of MIT and Harvard. The two decided to join, drawn by the 50 percent pay raise. They roomed in an attic apartment in Setauket and often dined together. When the bill came, they would pull out a special calculator that could generate random numbers. Whoever produced the higher number picked up the tab. “Renaissance was started by a couple of mathematicians,” Brown said in a 2013 conference for computational linguists. “They had no idea how to program. They’re people who learned how to program by reading computer manuals, and that’s not a particularly good way of learning.” He and Mercer had learned how to build large systems—with many people working on them simultaneously—which was a skill set they used to Renaissance’s advantage. Not that their new field was without challenges. “It’s all noise in finance,” he said. Renaissance also spent heavily collecting, sorting, and cleaning data, as well as making it accessible to its researchers. “If you have an idea, you want to test it quickly. And if you have to get the data in shape, it slows down the process tremendously,” says Patterson. Cerebral challenges weren’t the only incentive for Renaissance’s data-hungry scientists. They also enjoyed something more intangible: a sense of family. When the IBM crew arrived at Renaissance, Medallion was already producing annual returns, after fees, of at least 30 percent almost exclusively from futures trading. In the early days, anomalies were easy to spot and exploit. A Renaissance scientist noted that Standard & Poor’s options and futures closing times were 15 minutes apart, a detail he turned into a profit engine for a time, one former investor says. The system was full of such aberrations, he says, and the scientists researched each of them to death. Adding them all up produced serious money—millions at first, and before long, billions. “You need to build a system that is layered and layered,” Simons said in a 2000 interview with Institutional Investor, explaining some of the philosophy behind the firm and the Medallion model. “And with each new idea, you have to determine: Is this really new, or is this somehow embedded in what we’ve done already?” Once that’s determined, the team would figure out how much weighting to give it. Signals may eventually go cold over time but will usually be kept around because they can sometimes reemerge—or have unintended consequences if removed. A source says positions are held anywhere from seconds to seasons. In addition to language specialists, astrophysicists have historically had an outsize impact on the system’s success, according to people familiar with the firm. These scientists excel at screening “noisy” data. String theorists have also had a major role, and the Della Pietra brothers—who reunited with their former IBM bosses to work on equities—were the first of many with that background. The identical twins, now 56, have never strayed far from each other: They took an honors science program at Columbia University as high school students; attended Princeton as undergraduates, studying physics; and received doctorates from Harvard in 1986. “They always sat next to each other,” says Steven Strogatz, a math professor at Cornell University who remembers them as Princeton freshmen in a junior-year-level abstract algebra class. “Their talking involved a lot of arguing. It was passionate mathematical discussion, and they were always correcting the teacher or explaining something to each other.” Chan, who worked with them at IBM, remembers them screaming at each other—but never at anyone else, to whom they were kind and humble. Their twinship added another dimension, too. “They are almost telepathic,” he says. At Renaissance, the Della Pietras have shared adjacent offices separated by an internal window to facilitate discussion. “They are creative people and very competitive with each other,” says Patterson, to whom they reported for a time. The IBM crew focused on improving the system’s performance and efficiency. Since Renaissance’s models were short-term oriented, they spent time looking at execution costs and researching how their trades moved the markets—a particularly difficult problem to crack, according to other quants. They also ensured that the trades and profits matched what the system had intended, since a bad price or other glitch could throw off the whole operation. Simons determined, almost from the beginning, that the fund’s overall size can affect performance: Too much money destroys returns. Renaissance currently caps Medallion’s assets between $9 billion and $10 billion, about twice what it was a decade ago. Profits get distributed every six months. Thanks to Medallion, Simons—who still owns as much as 50 percent of the firm—has a net worth of $15.5 billion, according to estimates by the Bloomberg Billionaires Index. Laufer, who owns the next-largest stake (possibly as much as 25 percent), Brown, and Mercer are among other employees worth hundreds of millions of dollars. In some ways, money, not unlike the company’s familial feel, even binds the place together. With the exception of the scientists who depart for academia or to pursue philanthropy, folks don’t leave Renaissance. Why would they? The problems are complex, the colleagues first-rate, and the paychecks huge. As everyone became rich off Medallion, lifestyles changed. Trains to Manhattan gave way to helicopter commutes. Scientists swapped Hondas for Porsches. Fancy hobbies became normal. Simons’s cousin, Robert Lourie, who heads futures research, built an equestrian arena for his daughter, with arches so large that a bridge into New York City had to be shut down at night to facilitate their journey. Yachts also became a thing. Mercer has commissioned a succession of them, each called Sea Owl. For his part, Simons’s 222-foot Archimedes has a wood-burning fireplace. Both vessels have a propulsion system so novel that they don’t require an anchor. Always the merry ringleader, Simons planned company trips—to Bermuda, the Dominican Republic, Florida, Vermont—and encouraged employees to bring their families. Company lore is that on one of the firm’s ski trips, Simons, a longtime smoker, bought an insurance policy for a restaurant so he wouldn’t have to forgo his beloved Merits. Money has also threatened to destroy the family atmosphere. In 2001, Renaissance hired a Russian scientist who, like many of his peers, came west after the collapse of the Soviet Union: Alexander Belopolsky. Patterson was against bringing him aboard, he says, because he had recently worked on Wall Street, where he had job-hopped. His fears proved prescient. In 2003 he and another Russian, Pavel Volfbeyn, announced they were leaving for hedge fund Millennium Partners, where they’d negotiated healthy bonuses and the right to keep a large part of their own profits. Renaissance sued them and Millennium, worried the researchers would take the firm’s secrets with them. All parties later settled out of court. Around that time another of Renaissance’s Russian-born researchers, Alexey Kononenko, who received his Ph.D. from Penn State in 1997 and had also done a brief stint on Wall Street, was promoted within the equities group. Senior staffers ended up discussing Kononenko’s advancement during one of their regular dinners at Simons’s house. One person familiar with the situation says the scientists were just questioning why he had moved ahead of colleagues who had been there much longer, much the way an academic might complain about a younger colleague getting tenure. Other people with knowledge of the firm say Kononenko’s promotion was a significant event in Renaissance’s history and that the Russian had actually executed a power play. Whatever the reasons for Kononenko’s advancement, the outcome has safeguarded the well from which Renaissance’s wealth flows: Medallion has averaged more than a 40 percent return, after fees, since the dinner. 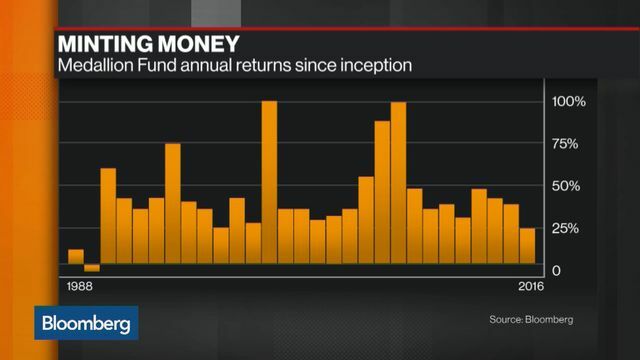 When rivals and former investors are asked how Renaissance can continue to make such mind-blowing returns, the response is unanimous: They run faster than anyone else. Yet all that running hasn’t always kept them on their feet when everyone else stumbled. In August 2007, rising mortgage defaults sent several of the largest quant hedge funds, including a $30 billion giant run by Goldman Sachs, into a tailspin. Managers at these firms were forced to cut positions, worsening the carnage. 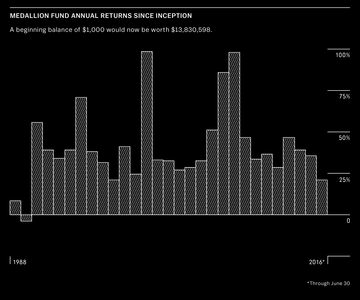 Insiders say the rout cost Medallion almost $1 billion—around one-fifth of the fund—in a matter of days. Renaissance executives, wary that continued chaos would wipe out their own fund, braced to turn down their own risk dial and begin selling positions. They were on the verge of capitulating when the market rebounded; over the remainder of the year, Medallion made up the losses and more, ending 2007 with an 85.9 percent gain. The Renaissance executives had learned an important lesson: Don’t mess with the models. No system lasts forever, say quants. They ask how long Medallion’s magic can continue. But seven years after Simons’s retirement, the fund’s money-printing ways persist. 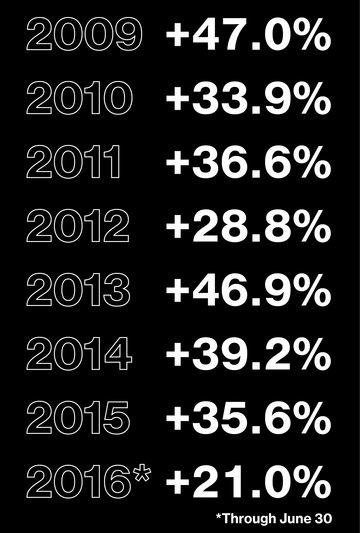 Even in the first half of 2016, while many hedge funds struggled, it made more than 20 percent. Wealth and influence at Renaissance have grown apace. Yet as successful as Renaissance has been under Brown and Mercer—who are 61 and 70, respectively—industry insiders wonder how the firm will handle its next succession. They also reserve their reverence. Take, for instance, the anecdote from an invite-only conference earlier this year. 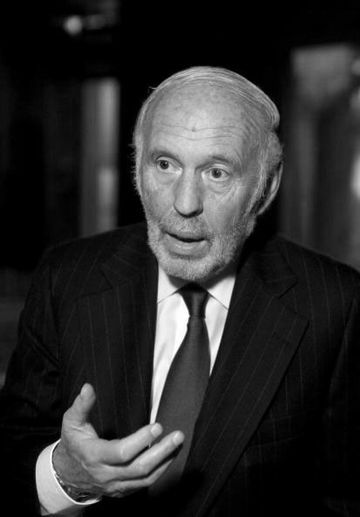 An audience member asked a panel of quant managers, “Who would be your dream hire?” After a bit of nervous laughter, one of them gave his honest answer: Jim Simons. This story appears in the December 2016 / January 2017 issue ofBloomberg Markets.